This tool gives you a macro for the 4 sliders in the master-track groove control. 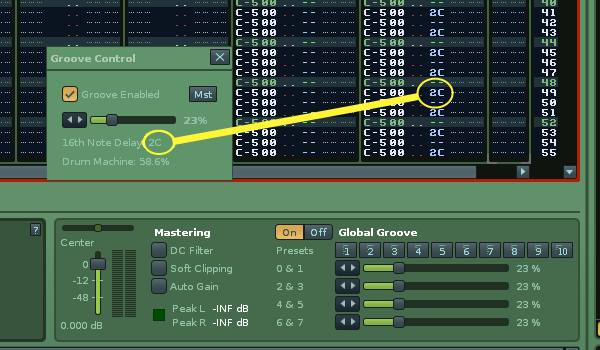 Also a button to navigate to the master track and a checkbox to enable/disable groove. When all the sliders are set to the same percentage in renoise you get standard style drum machine swing. Having one slider to control all four helps to hone in on your ideal swing setting quickly and accurately. Controls all sliders to the same percentage so is used for traditional style swing. The renoise percentage value is also given as an equivalent delay column readout. In the main picture above, the yellow line hilights how a 23% Groove/swing would be written as 2C delay values on every other 16th note manually in renoise (4 lines per beat) . Here the left track with Global Groove switched on, sounds the same as the right track with Global Groove switched off. The 2C`s in the pattern are just for illustration, this tool does not add any pattern data in use. The readout is just to give you a better idea of what the renoise percent value means. Gives what the equivalent percentage would be from a Linn LM-1 drum machine and other machines/DAWs that follow its convention. At around 66.6% you should get "perfect triplet swing" , so if you played a note at 33.% you would have a musical triplet, over two 16th lines. As the middle note of the triplet is omitted you get the count [1 x 3], [1 x 3],-- where x is silent. --Added "Drum Machine" readout that gives the equivalent percentage readout for machines like the Linn LM-1 (First ever groove implementation), and some other DAWS.